Navigation: Home » Personal Finance » How Many Developers are There Per Zip Code in America? 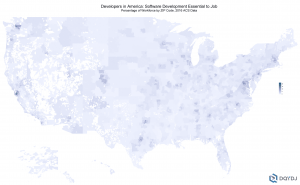 How Many Developers are There Per Zip Code in America? We’ve recently been writing posts about the number and concentration of developers in the United States: How Many Developers are There By State? 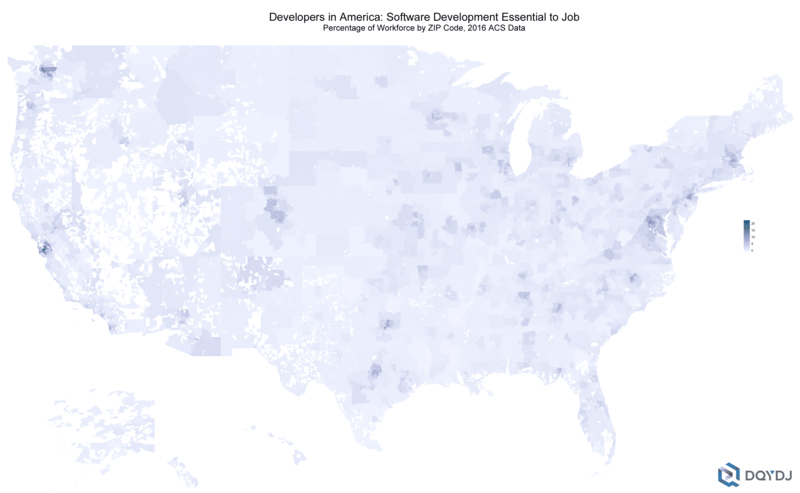 and How Many Developers are There By County? Today we’ll be zooming in even further and estimating the number of developers there are per zip code. Further down the page we’ve also included a calculator for you to lookup whichever zip code you’d like. Once again, we are dividing developers into three categories – a ‘core’ development category and a number of other professions where software proficiency is usually essential to the job. Both the raw data and the calculator maintain the divisions between the three. We made a number of choropleths with the data. Here are two of them – we’d suggest using a 4K monitor to view them(!). We had to do a bit of work to get these estimates. The numbers originate from the 2016 American Community Survey crossed with the BLS Standard Job Classification System (our definition of ‘developers’ is laid out in our first article of the series). Next, we divide the population into the Public Use Microdata Areas (PUMAs), which are the smallest geographic divisions provided in the public microdata files. Getting from PUMAs to Zip Codes is a bit complicated. We used the Missouri Census Data Center’s online Geographic Correspondance Engine and exported crosswalks based on 2012 estimated populations. After that, a Python script walked through each PUMA and added the numbers up for each zip code. Looking at the numbers at this resolution reveals how dominant engineering is in the Bay Area. There are a number of zip codes in the Bay Area where more than 1 in 5 employed workers need software proficiency for his or her job. The zip code zoom also lets us see some other hot engineering spots. Seattle is especially prominent, as is Chicago, Boston, Washington D.C. and Dallas. Print out a copy of the bigger map and look around – you might be surprised to see where engineers and developers are living! Anything interesting pop out to you in the data? How many developers live where you live? Huh, interesting. I live in Texas so there\’s not a gigantic tech population here. But we\’re trying to grow the influence of tech here, especially since the cost of living is much more reasonable here than in the Bay Area. 🙂 Another thing to consider is that there\’s less competition in less-concentrated areas, which means the potential for better and higher-paying jobs. Yeah, Austin and Dallas especially are making quite the play. I might have to go back like a decade and rerun this and see where the biggest gainers/decliners are – don’t count on the cost of living staying cheap, haha.